This blog only applicable for Collaborative Forecast, at this moment Customizable Forecast is scheduled for Retirement as of Summer ’20. 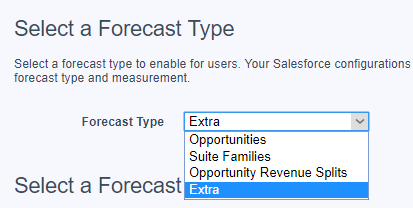 By default, Salesforce will forecast using Amount field from Opportunity for Revenue forecast. 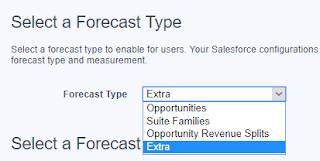 However, to fit your business needs, you can add additional forecast type, based on a custom field in Opportunity, it must be currency fields. In this blog, I will add a custom currency field from Opportunity called Extra Income. 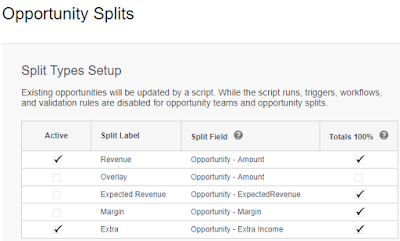 I'll select the field 'Extra Income' and type in 'Extra' as Split Label. 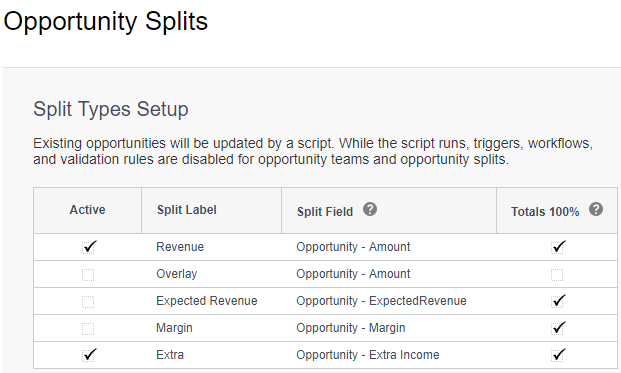 Tips: on the Split Type, the Totals 100% must be ticked, otherwise, forecast with the custom fields will not work. 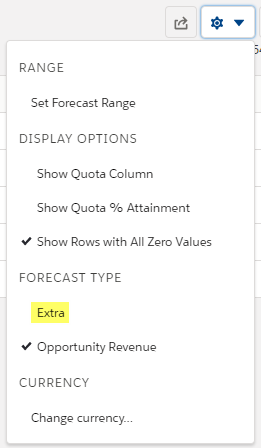 Now, I need to configure forecast setting, click the link "+ Add another forecast type" then select Extra. 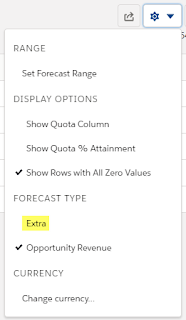 Then, you select a Forecast Measurement (Revenue or Quantity) and select fields to show in the Opportunity List. You need to click Save button to save, otherwise, it will not save, even you have click OK button in many screen. Now, let us see if this will work. This is the default forecast based on Amount, it called Opportunity Revenue. Now, let us flip to the new Extra forecast we just create, click the gear icon on the top right. 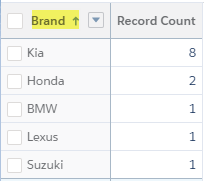 Now, let us forecast with our new forecast type "Extra"
We sort the report by Brand -- which is a picklist field, but the order is not working properly, I expect it should sort by alphabetically, the same order result we will see in Classic. The order of groupings containing Picklist field values is based on how the values are arranged in the picklist field itself, not the arrangement selected in the Sort Order. The easy fix is by change the picklist value for that field, see this article Sort Picklists, if you need guidance on how to change picklist value. 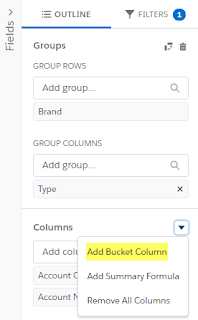 However, if you don't have admin access, or for some reason, you are not allowed to change the order, you can add bucket field in the report, make sure to create the buckets in the order that you want the picklist values to be displayed on the report. So, instead of using the original field, use this bucket field in the report. Here an idea to vote to sort picklist values alphabetically, currently only have 470 points after 9 years. Emoji in Salesforce works in both Lightning and Chatter. 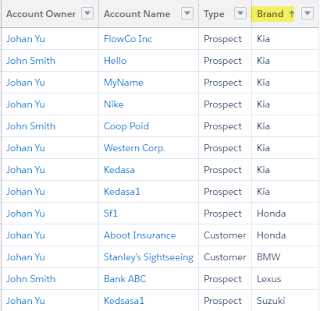 Einstein Analytics supports security predicates, a robust row-level security feature that enables you to model many different types of access controls on datasets. 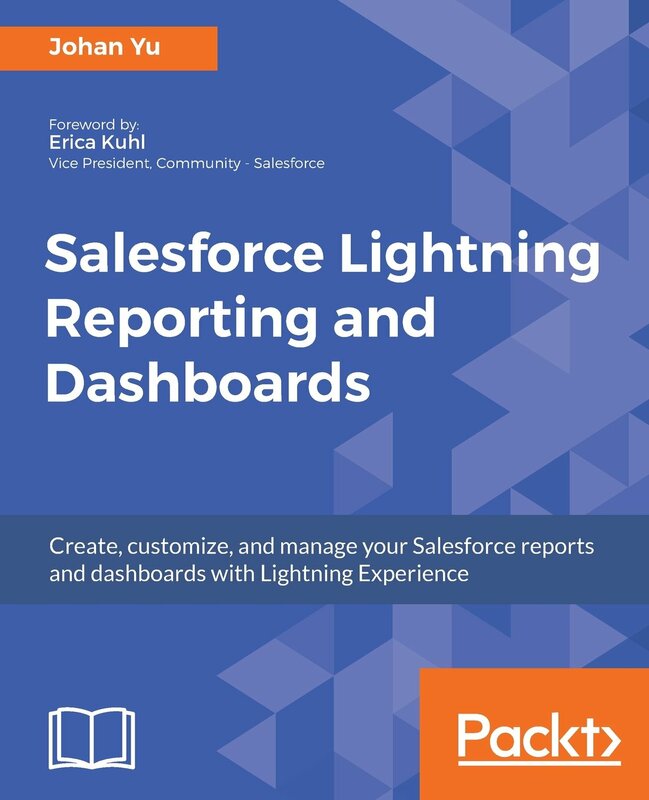 Einstein Analytics also supports sharing inheritance, to synchronize with sharing that’s configured in Salesforce, subject to certain limitations. If you use sharing inheritance, you must also set a security predicate to take over in situations when sharing settings can’t be honored. This blog will discuss setting up security predicate for Dataset created from CSV file. By default, when you load CSV file to create a new dataset, the security predicate will be empty, which mean everyone has access to the dataset can see all rows. 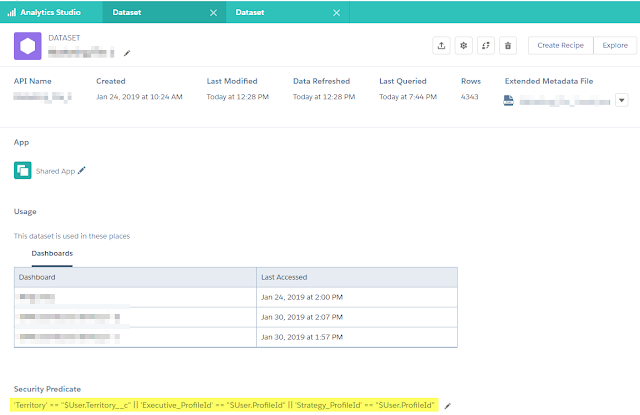 We can build security predicate even for CSV file is not originally come from Salesforce, as long as there is an identifier that links between CSV file with Salesforce data. We can build security predicate after the dataset created in Einstein Analytics. If you check above basic syntax again, then change the syntax to "$User.Id" == 'UserId', this syntax become invalid and will be rejected by the system. Even the values are the same, but security predicate must always start with dataset column, and not the other way round. (‘Expected_Revenue’ > 4000 || ‘Stage Name’ == "Closed Won") && ‘isDeleted’ != "False"
The expression cannot exceed 1,000 characters. There must be at least one space between the dataset column and the operator, between the operator and the value, and before and after logical operators. This expression is not valid: ‘Revenue’>100. It must have spaces like this: ‘Revenue’ > 100. 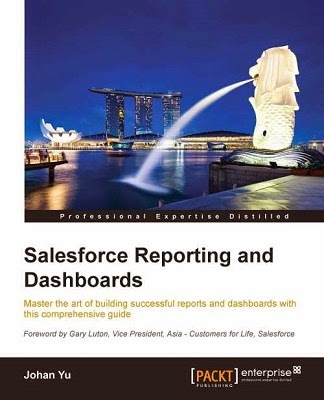 This mean, a group of Salesforce users should not be impacted by security predicate. One of the simple ideas is to add unique values, such as User Role Id, or User Profile Id, or custom field from User object to the dataset security predicate, and to the data itself. Scenario: all users with Profile = Executive are allowed to see all data, otherwise, only see data the same with user Territory. In this scenario, Territory is a custom field in user object and also available in the Dataset. 'Territory' == "$User.Territory__c" || 'Executive_ProfileId' == "$User.ProfileId"
The first part (in purple) is to allow users to see only data where Territory in the dataset is the same with Territory of user defined in the user object. The second part (in green) allows all users with Executive Profile allow to see all data, that's why we use or logic (||). 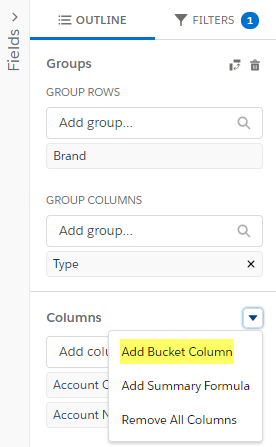 Using the same method, you can add Role as exception too, just add another column and fill the Role Id to all rows. However, if you need to define more than 1 profile or 1 role, you need to keep duplicate the columns in CSV file add use || as the exception, e.g. 'Territory' == "$User.Territory__c" || 'Executive_ProfileId' == "$User.ProfileId" || 'Strategy_ProfileId' == "$User.ProfileId", I know this is not a pretty solution, but it works. You can define dataset security predicate by edit the dataset and enter a valid Security Predicate. The system will check and reject if the security predicate syntax is invalid, such as "$User.Id" == 'UserId' (wrong order), also if the value does not exist, such as: 'UserId' == "$User.Field__c" (Field__c field is not exist in User object). 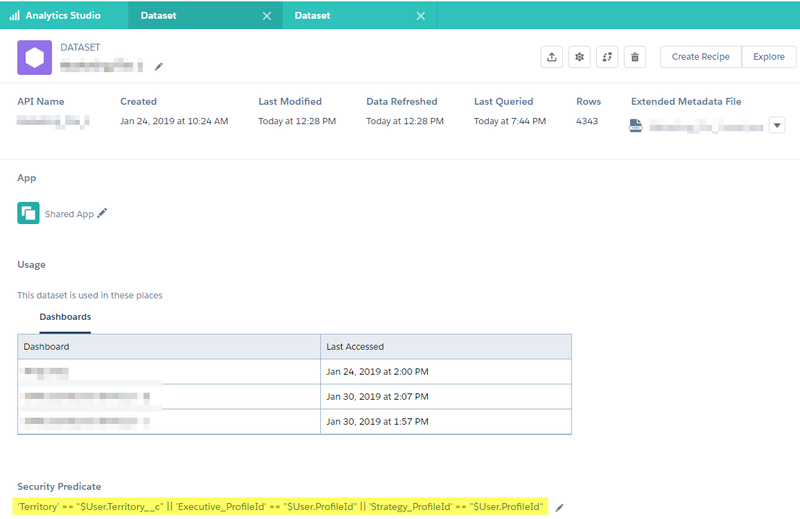 However, the system will not validate and not reject if the column name does not exist, such as: 'UserField' == "$User.Id" (UserField does not exist in the dataset column). If you replace data for an existing dataset, the security dataset defined will be stayed, including when you restore from the previous dataset.